Skagen is certainly not the most popular smartwatch brand out there, but you can absolutely rely on this Fossil subsidiary to occasionally release some very classy, traditional-looking timepieces with decent spec sheets and reasonable price points. If $275 still feels too rich for your blood or you don’t necessarily need all the Wear OS complexity, you may want to think about getting a basic Skagen hybrid smartwatch... at $47.99. Wait, what? It’s true, DailySteals has three such models on sale for that insanely low price right now, with a one-year warranty included and free nationwide shipping. You’re looking at brand-new, unused, unopened, and untouched wearable devices compatible with both iPhones and Android handsets, although these are obviously not as “smart” as an Apple Watch or Samsung Galaxy Watch. The “hybrid” smartwatches on special offer for a limited time don’t come with touchscreens, GPS functionality, NFC support, or even the ability to show notifications... per se. What you do get is a decidedly stylish analog watch face that you cannot turn digital, as well as a combination of “subtle” vibrations and an inner dial on the men’s version for alerts and activity goal tracking. Unfortunately, there’s only one model for men discounted to $47.99, with a rose gold case and black leather band, while the two women-friendly variants come in rose/tan and rose/gray combos, lacking however that handy inner dial. Naturally, you don’t need to worry about recharging the battery of these Skagen hybrid smartwatches, which are also water-resistant up to 30 meters. Technically, all three models are currently listed at $69.99, but applying the coupon code “22OFFSMART” before checking out will save you an additional 22 bucks. 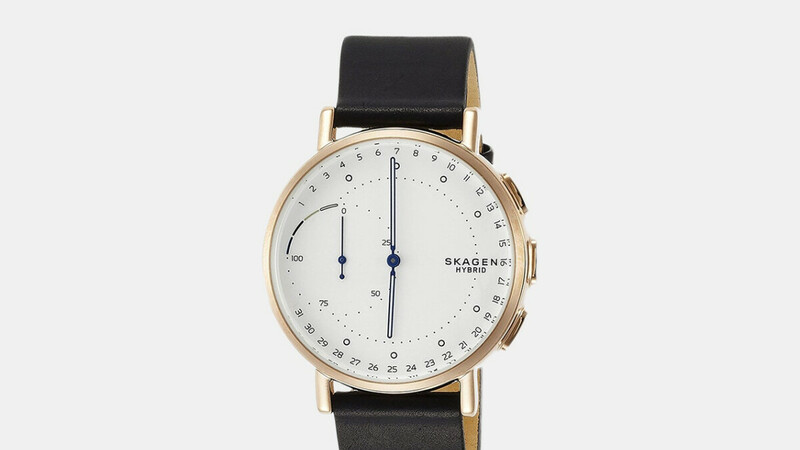 In case you’re wondering, these would normally set you back $175 and up apiece, currently starting at $123 on Skagen’s official website. That's truly a massive discount. How do you even read that thing? I saw it at that price before but man idk.